All embroidery on this rug are done by hand. Suzani is an embroidered and decorative tribal textile made in Afghanistan, Tajikistan, Uzbekistan, Kazakhstan and other Central Asian countries. This rug is made by best quality of lamb wool. THE SHAPE IS IRREGULAR DUE TO BE HANDMADE. IT'S WOOL PILE ON COTTON FOUNDATION. Patchwork rugs are made from a compilation of older rug pieces that have been cut and stitched together by hand. This rug is well-made, and has a thick pile. TYPE: handknotted, wool pile with cotton warp & weft. AGE: about 20 years. SIZE: 2.80m x 1.70m - 9ft.2" x 5ft.7". THE RUG ATTIC. You can always find hidden treasure in the Attic! Persian hand-knotted rug made in the village of Saruq which is around the Hamadan area, famous for its beautiful variety of village rugs. Persian hand-knotted rug made in the village of Songhor which is around the Hamadan area, famous for its beautiful variety of village rugs. This is an area rug with a lovely combination of colours and motifs. Persian hand-knotted rug made in the village of Saruq which is around the Hamadan area, famous for its beautiful variety of village rugs. This is a large area rug with a lovely combination of colours and motifs. Persian hand-knotted rug made in the village of Mahal which is around the Hamadan area, famous for its beautiful variety of village rugs. This is a large area rug with a lovely combination of colours and motifs. This Persian Gabbeh rug is a simple design combining old and new. This rug also has a cloth back. A tree design field decorated with various floral motifs in the rich maroon background enclosed by bands of narrow borders in similar patterns. This runner is ideal for long and narrow spaces around the house and has an eye-catching colour and design. Persian hand-knotted rug made in the city of Isfahan, famous for its beautiful variety of city rugs. This is a large area rug with a lovely combination of colours and motifs. Almost all Qashgai rugs will have a wool pile and wool foundation unlike many of the village rugs that are mostly wool pile on a cotton foundation. Persian hand-knotted rug made in the town of Kashan, famous for its beautiful variety of rugs. This is an area rug with a lovely combination of colours and motifs. Persian hand-knotted rug made in the town of Mashad, famous for its beautiful variety of town rugs. This is a large area rug with a lovely combination of colours and motifs. 100% genuine original Persian hand-knotted rug made in the village of Taj Abad which is around the Hamadan area, famous for its beautiful variety of village rugs. This is an area rug with a lovely combination of colours and motifs. Persian hand-knotted rug made in Afshar, famous for its beautiful variety of village rugs. This is an area rug with a lovely combination of colours and motifs. Persian Gabbeh Nomadic Rugs are distinctive with their thick pile and contemporary designs. This particular one is a combination of Gabbeh and traditional, made into a patchwork rug. The rug has a cotton backing. Patchwork rugs are made from a compilation of older rug pieces that have been cut and stitched together by hand. This rug also has a cloth back. Mon – Sat 10 am – 6 pm. QUALITY FINE KNOTTED. ITEM CODE 028 M. AGE IN YEARS. IS IN GOOD CONDITION, CLEAN WITH A RICH PILE. Mon – Sat 10 am – 6 pm. AGE IN YEARS. 100 % HANDMADE MODERN PERSIAN RUG HAS A LOVELY APPEARANCE INDEED, IT HAS A SPLENDID DESIGN ON A NICE CREAM COLOUR FIELD. Mon – Sat 10 am – 6 pm. AGE IN YEARS. 100 % HANDMADE OLD GABBEH WOOL ON WOOL PERSIAN RUG HAS A DELIGHTFUL APPEARANCE INDEED, IT HAS A SUPERB DESIGN ON A YELLOW FIELD SURROUNDED BY TERRIFIC BORDERS. Mon – Sat 10 am – 6 pm. AGE IN YEARS. Persian hand-knotted rug made in the town of Kashan, famous for its beautiful variety of rugs. This is a large area rug with a lovely combination of colours and motifs. 153x98cm 5'1"x3'3". The Gabbeh is not perfectly rectangular or evenly straight due to being handmade. Style Tribal Gabbeh. 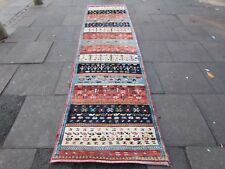 An Old Traditional Hand Made Persian Oriental GabbehRug. 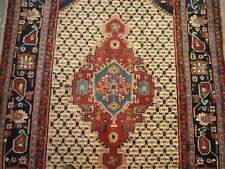 Very Nice Wool Piles Hand Made Persian GabbehRug. Size is approx 330cm x 246cm. Persian hand-knotted rug made in the city of Tabriz, famous for its beautiful variety of city rugs. This is a large area rug with a lovely combination of colours and motifs. Persian hand-knotted rug made in the Hamadan area, famous for its beautiful variety of village rugs. This is an area rug with a lovely combination of colours and motifs. Persian hand-knotted rug made in Hossein Abad, around the Hamadan area, famous for its beautiful variety of village rugs. This runner has a lovely combination of colours and motifs. 100% genuine original Persian hand-knotted rug made in the village of Mahal which is around the Hamadan area, famous for its beautiful variety of village rugs. This is a large area rug with a lovely combination of colours and motifs. Persian hand-knotted rug made around the Hamadan area, famous for its beautiful variety of village rugs. This is a large area rug with a lovely combination of colours and motifs. Persian hand-knotted rug made in the city of Isfahan, famous for its beautiful variety of rugs. This is a large area rug with a lovely combination of colours and motifs. Persian hand-knotted rug made around the Hamadan area, famous for its beautiful variety of village rugs. This is an area rug with a lovely combination of colours and motifs. Great design and superb colours. 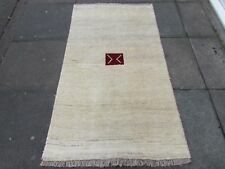 The kilim is made with very fine hand spun wool in natural dyes. The kilim has been hand washed and is ready for use or display. Rug Type - Hand Knotted. Fabric - Wool. Persian hand-knotted rug made in Hossein Abad, famous for its beautiful variety of village rugs. This is an area rug with a lovely combination of colours and motifs. Hand Knotted original Persian Runner. Excellent condition. Process: Hand Knotted. Rug Type: Pakistan Buchara 3ply. Newly bought July 2016 - original price £630.00. Origin: Pakistan. 100% genuine original Persian hand-knotted rug made in the village of Shahrbaf which is around the Hamadan area, famous for its beautiful variety of village rugs. This is a large area rug with a lovely combination of colours and motifs. Top Quality Handmade knotted Beige background Vegetable dyed Natural Color Rug.